The spacious and rich interior of the 2018 Chrysler Pacifica can be found at Southern Greenbrier Chrysler Jeep. With high-quality materials, the cabin provides comfort that you normally need to be in your own home to find. The Chrysler Pacifica comes in 6 different trims: L, LX, Touring Plus, Touring L, Touring L Plus and Limited that comes with an abundance of advanced safety and technology features. Each trim has a V6 engine and responsive front-wheel drive. 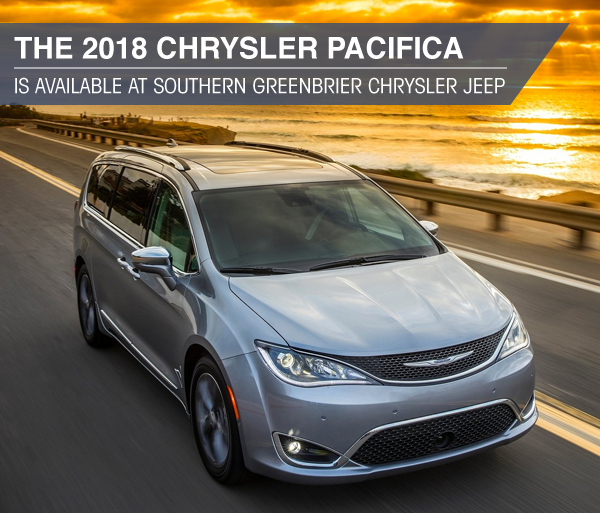 Visit Southern Greenbrier Chrysler Jeep in Virginia and test-drive the new 2018 Chrysler Pacifica today. The 2018 Chrysler Pacifica can seat 7 passengers comfortably, and it can even seat 8 if you equip the available second-row middle seat. When the rear seats are folded down, you'll find a massive 140 cubic feet of cargo room. Unlike the Honda Odyssey, however, the second-row seats don't need to be removed; Stow 'n Go seats in the Pacifica fold down into the floor. When you get a new 2018 Pacifica, it comes with a 7-inch touchscreen display, Chrysler's Uconnect® infotainment system, Apple CarPlay™ and Android Auto™ and more. The Toyota Sienna doesn't offer Apple CarPlay or Android Auto in any of their trims. Stop by Southern Greenbrier Chrysler Jeep today to test-drive the 2018 Chrysler Pacifica. Generating 287 horsepower with its standard V6 engine, the 2018 Chrysler Pacifica packs quite the punch. Chrysler's minivan offers smooth acceleration, and it gets the job done on a daily basis. On top of getting the job done, the Pacifica saves you money at the gas pump. The 2018 Pacifica earns an EPA-estimated 18 MPG city and 28 MPG highway. Compared to the Pacifica, the Kia Sedona's EPA-estimated 24 MPG highway is less efficient. >Feel the power of the 2018 Chrysler Pacifica for yourself by test-driving one at Southern Greenbrier Chrysler Jeep today. The 2018 Chrysler Pacifica earned a perfect 5-Star Overall Safety rating from the NHTSA. Also, the IIHS named the Pacifica a Top Safety Pick after it aced every crash test. The 2018 Pacifica comes standard with Rear Cross Traffic Alert, Blind Spot Monitoring and Rear Parking Sensors with Automatic Braking. This is what the best looks like, so put your family's safety behind the wheels of the best. Drivers in Chesapeake, Suffolk, Portsmouth, Virginia Beach, VA and Elizabeth City, NC are putting their families in the 2018 Chrysler Pacifica's care, and you can do the same. Visit Southern Greenbrier Chrysler Jeep today.